Can I press pause please? I look to my boy, with those beautiful big blue eyes, swathed in innocence and that cheeky grin that is free from the blemish of the stress that walks hand in hand with age, and my first instinct is to lock all the doors, wrap him up so tightly in my arms and never let the world come too close. 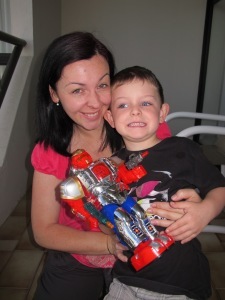 He’s been the recipient of so many of my smothering cuddles of late, yesterday especially, and again this morning, each time I see another photo of the innocent smiling face of Daniel Morcombe. How does a parent get past such a vile thing? I shudder. I cant think too much about lest I crumble into another sobbing mess for a loss of a boy I only knew through the TV screen. Instead I channel those emotions into kisses for my own darling boy. affection; I wont suddenly hear him say to me at the dinner table ‘So Mummy, I was thinking, maybe you and me could go on a date sometime?” and even though at days end I think my ears might bleed because of the fact he has not stopped talking from sun up to sun down, I’ll dread the sounds of silence that go hand in hand with being a teen. I know as parents its our job to have brought our children up to be mature, responsible young adults who make the right choices, but still it doesnt make this mumma any less panicky about the future. Can’t I just keep him this way, where I know where he is, how he is and safe in the knowledge he wants just as much right now to be with us in return? pause – it is indeed a beautiful thing when children are so free of inhibitions – it is also the damn cutest thing to come out of a hugely busy, stressful week and every time I see it my heart swells and cannot help but laugh!